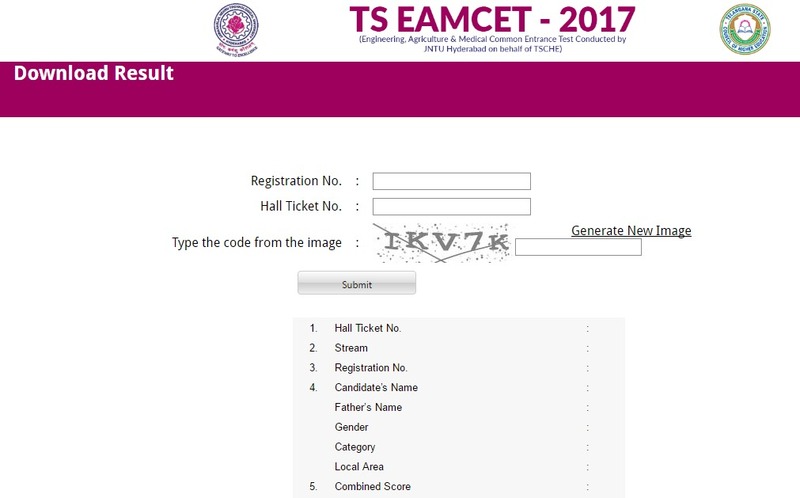 TSEAMCET Result 2017 declared - Check Telangana EAMCET Exam Merit list Cut off marks Ranks - TSEAMCET exam was held on 12.05.2017 for admission into B.SC. B.Tech. B.Pharmacy, D.Pharma courses offered in Government Colleges and Private Colleges (convener quota) for the academic year 2017-18 in the State of Telangana. This test was organized by JNTU, Hyderabad on behalf of TSCHE. Result date: The Telangana EAMCET result is declared on 22 May 2017. The merit list as well as ranks will be out soon. You will be notified via this page as soon as they got declared. 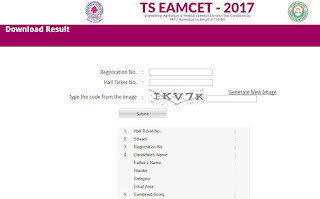 Criteria for Ranking: The candidates who have secured qualifying marks in TS EAMCET-2017 and candidates belonging to the category of Scheduled Caste and Schedule Tribe, for whom qualifying marks have not been prescribed, shall be assigned ranking in the order of merit on the basis of combined score obtained by giving 75% weightage to the marks secured in TS EAMCET-2017 and 25% weightage to the marks secured in the relevant group subjects namely Biology, Physics, Chemistry of the qualifying examination. To check the result of TSEAMCET exam, you have to visit the website at link below. As the result gets declared, you will be able to check it with a direct link from here.